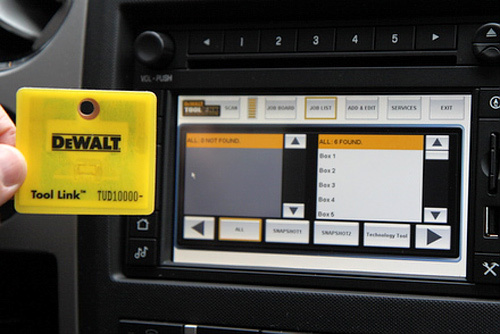 Ford & DeWalt RFID Tool Link Ensures No Tools Left Behind | OhGizmo! At times RFID technology gets a bad rap, but that’s because it’s not always the best solution for every situation. (ie Passports etc.) However, here’s one example where the technology really shines. Developed by DeWalt, Tool Link is a $1,120 option for Ford trucks that uses RFID tags to keep track of your tools so that you don’t accidentally leave one behind at a job site. The system comes with 50 tags that can be attached to tools and hardware from any manufacturer, an RFID scanner plus software that runs on the truck’s in-dash computer, as well as a couple of RFID antennas located in the truck’s bed. Once you’ve created a database of your hardware the system can keep track of what items were in the truck at the start of the day, and what items are missing before you leave the construction site at the end of the day, before they go missing permanently.